Has everybody on your team gone to a conference this year? Whether it’s for budget reasons, lack of time or even family matters, it’s not always possible to get everybody to fly across the country to attend one of the great higher ed conferences out there. That’s why I launched – back in 2013 – the Higher Ed Experts Online Conferences, to offer an affordable alternative to spend a day with your team or user group on campus to learn best practices and get energized. 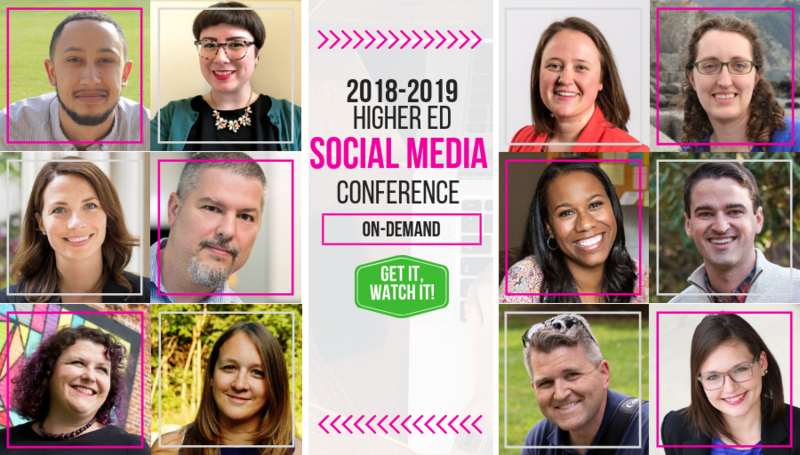 The good news (and I’m sure everybody in higher ed can use some good news now) is that the 6th Higher Ed Social Media Conference is now available on-demand! 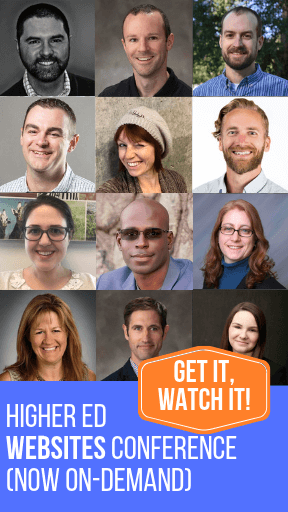 Why should you team watch the 6th Higher Ed Social Media Conference? This year again the program is fantastic – one of the best programs around focusing on social media for higher ed. With 12 sessions scheduled, you get a great variety of topics presented by higher ed professionals who know social media for higher ed. We have seasoned presenters some of you might have seen at higher ed conferences as well as brand new voices with very original ideas. Your colleagues who attend Higher Ed Experts’ online conferences can’t stop raving about the format of our conferences. With 12 sessions of 10 minutes each, the 6th Higher Ed Social Media Conference is the perfect format to provide professional development for your social media user group (SMUG) and spark great ideas within your social media team. More and more institutions sign up for the event, book a conference room or a large auditorium, set up a big screen and invite as many people as possible to attend the live event. Krista Boniface, Social Media Officer at the University of Toronto, wrote a post last week to share some great tips on how to host a watch party for your goup. Since the recordings are available for a year, you can also use these recordings to start a conversation with your team in monthly “lunch & learn” meetings. After watching a 10-minute recording, it’s really easy to brainstorm around the ideas or best practices discussed in the session. That’s professional development that keeps on giving! Scheduled on November 28, 2018, the conference is just after Thanksgiving but before the big rush leading to the end of the year. It’s also a great way to thank and energize your team with insightful professional development — without breaking your budget (you can have as many people as you want in a room for 1 registration fee) or worrying about travel delays or headaches (remember? It’s online AND recorded). Too good to be true? You’re right, there’s a catch: available virtual seats are limited. We’ve actually already run out of the initial allotment at the early bird price and have a few more team seats at the regular price. If you want to attend this conference with your team, register while you still can.